BritBox offers U.S. audiences the first U.S. look at the 2017 comedy Bliss as part of its August schedule. The streaming service also premieres new episodes of its first original program, The Bletchley Circle: San Francisco. “Bliss” stars Stephen Mangan as an accidental bigamist caught between two wives, played by Heather Graham and Jo Hartley. David Cross, who stars in “Arrested Development” and previously wrote and starred in the British-set series “The Increasingly Poor Decisions of Todd Margaret,” wrote the six-episode season. Read below for more August premieres from BritBox, the subscription streaming service from BBC Studios and ITV. Set during the unmistakable social change of the mid 1950s, BritBox’s first original series, “The Bletchley Circle: San Francisco,” continues its first season with five more episodes. Picking up in 1956, the follow-up to “The Bletchley Circle,” the new series finds two of the original lead characters, Millie (Rachael Stirling) and Jean (Julie Graham), helping to solve crimes in America. They join forces with two U.S. codebreakers to tackle a string of new murder cases in San Francisco. Marley Wise has a rare gift: She can talk to the dead, which sadly now includes her husband, her lover and the local vicar. The series follows as she works, finds new love and most importantly, lives—all while sharing her life with these three ghosts. Can they all learn to co-exist under the same roof? Using fixed rig and handheld cameras and with unique access to both detectives and suspects, this series follows Bedfordshire Police over a 24-hour period as they respond to emergencies, investigate crimes and arrest suspects. Viewers will watch as police work against the clock to put criminals behind bars. This multi BAFTA-winning true crime drama tells the poignant and powerful story of a childhood friendship broken by abuse. The very system that should have kept under-age girls safe instead endangers them. Maxine Peak and Lesley Sharpe star in this three-part series based on the victims of the Rochdale sexual abuse scandal, this brutally honest three-parter is part thriller and part miscarriage-of-justice drama. This doc series takes a searching look at the public and private lives of the British royal family. The six episodes offer a revealing insight into the world’s most famous family, looking at how the monarchy works, how it has evolved over the centuries and the challenges it faces in the present and the future. From acclaimed writer, director and performer David Cross (“Arrested Development”), this unmissable new comedy from Sky TV follows the complicated double life of a successful travel writer who, through extenuating circumstances, finds himself living between two families. 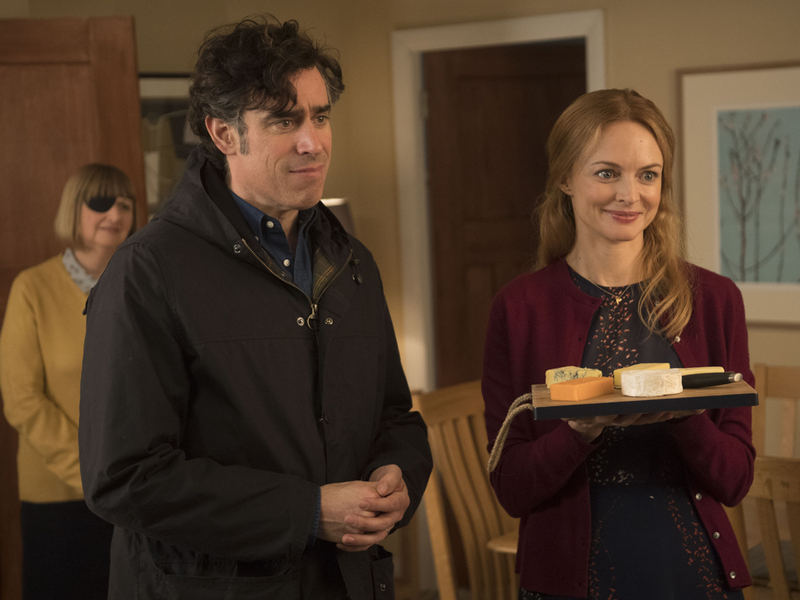 Heather Graham and Stephen Mangan star. It has been 100 years since the first women over the age of 30 (who owned property) were allowed to vote in the United Kingdom. In this dramatized documentary, popular historian Lucy Worsley tells the story of a group of less well known, but equally astonishing, working-class suffragettes who decided to go against every rule and expectation that Edwardian society had about them. Lanarkshire’s Detective William Muncie (Douglas Henshall) hunts the notorious killer Peter Manuel (Martin Compston) in this three-part miniseries. This simulcast event set against the iconic backdrop of Edinburgh Castle, is a spectacular display of military ceremony from across the commonwealth and the world. The term Tattoo is used to describe an evening of entertainment performed by military musicians as they end their day. Millions of viewers from across the globe watch the show, which features a large variety of military bands and hundreds of performers. It culminates in a firework display from the top of the castle. BritBox’s popular Panel Channel adds another option this month. Hosted by Alan Davies and featuring an eclectic mix of A-list and up-and-coming faces, this unique panel show finds guests sitting around a small table for a discussion about, well, anything. Davies uses no script, has no rehearsals and no agenda. He just wants to make each episode interesting and funny.